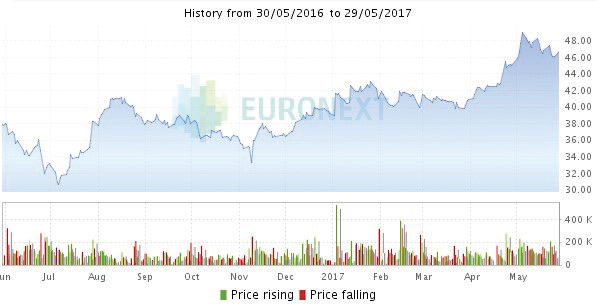 Which services does Euronext provide to listed companies? Account Manager: a dedicated contact to assist you in your day-to-day life on the stock exchange and who will be in regular contact with you throughout the year. A direct entry point into the Cash Markets, giving you feedback from real-time events that may affect the price of your share. 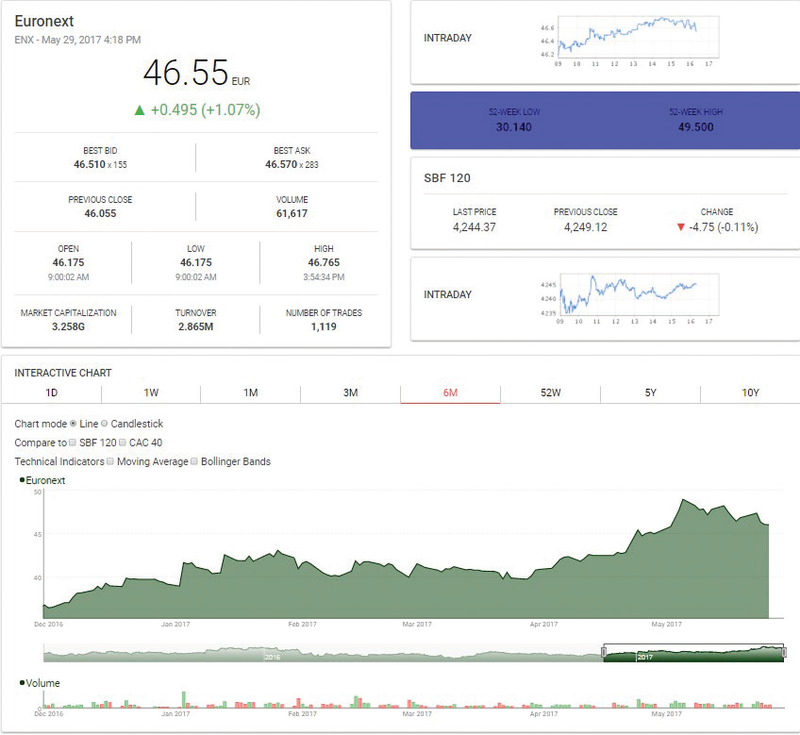 The End of Day Market Summary, an automatic email sent to you at the end of each trading day, giving you an overview of your stock’s trading that day. Connect, a secure web portal giving you real-time market intelligence and allowing you to publish press releases and update your company profile and financial calendar on our website, helping you increase the visibility on your stock. Email alerts enabling you to set an alerts on several parameters of your stock, such as open, high, low, volume, variation from a certain index, or when your stock is halted. The Listed Emblem, an emblem symbolising that you are listed on Euronext markets free for you to use in all your marketing material and on your website, helping you to increase the visibility of your stock. For further details see FAQ: How can I receive my Listed Emblem? How can I get a price feed of my stock on my corporate website? Euronext provides 3 different web services allowing you to display in your web site real time trading data of your stock. tailor your stock information to match your brand and visual identity. How can I receive my Listed Emblem? can also set email alerts on your share and create watch lists. Please contact ExpertLine if you would like access to the Connect web portal. 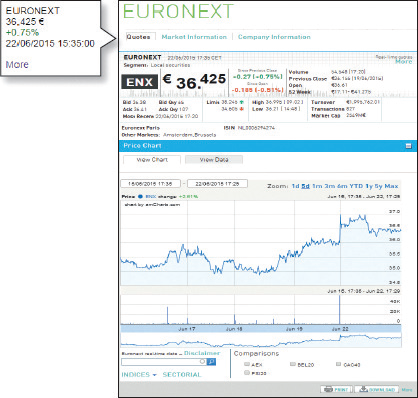 The information of my company on Euronext’s website is not correct. How can I change this? 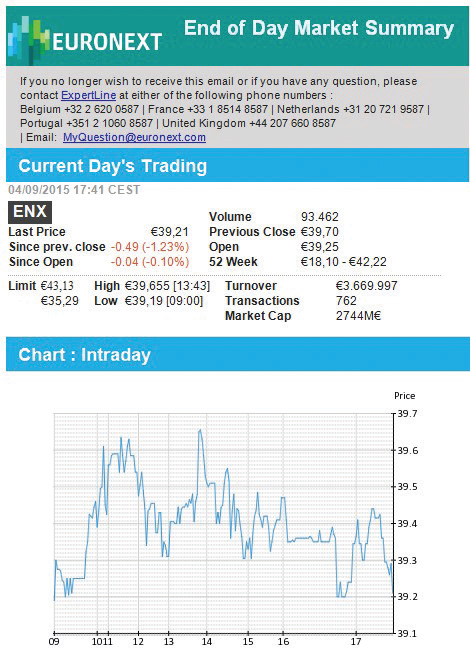 The information of your company on our website www.euronext.com can be changed by yourself, via the Connect web portal. You need to have a Connect account with an Editor/Publisher profile in order to do so. 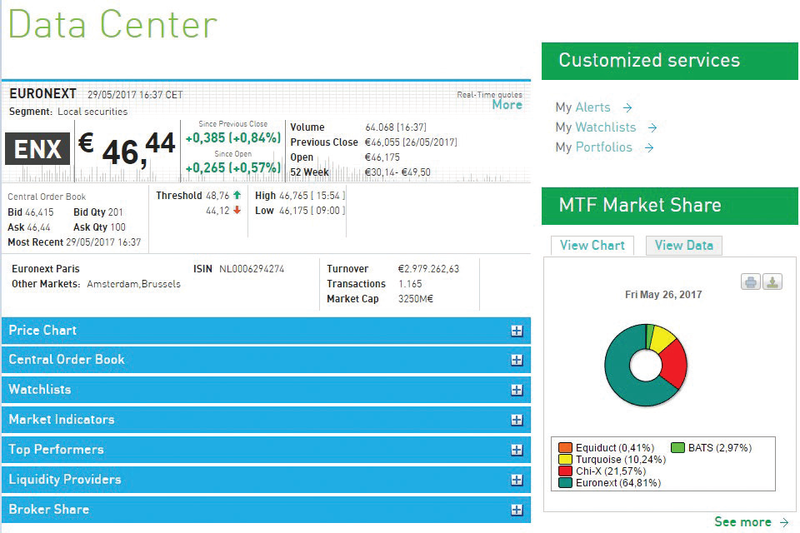 How can I receive the End of Day Market Summary? Please contact ExpertLine if you wish to receive the End of Day Market Summary. If you already have a Connect account, you can activate the End of Day Market Summary in your account settings (under “My Account”).